Located in the Perseus Arm of the Galaxy, the Heart nebula (right) and the Soul nebula (left) are two bright nebulae (although a telescope is needed to see them) in a region of the Galaxy where a lot of stars are forming. IC 1805 (the Heart nebula) is also sometimes called the 'Running Dog nebula' because it is said to resemble a running dog when viewed through a telescope. Below is a list of the main nebulae in this region. 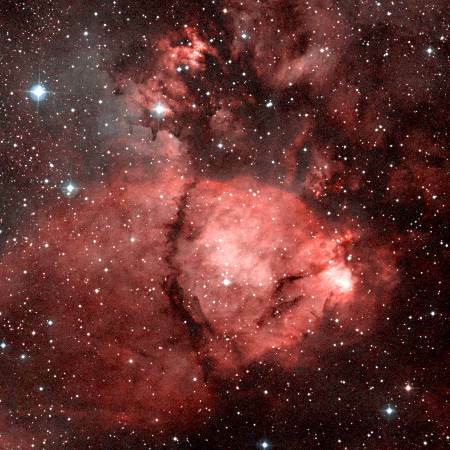 IC 1805 and IC 1848 are the two most important of these nebulae. IC 1795 is a bright nebula attached to the right side of IC 1805. NGC 896 simply seems to refer to the brightest part of IC 1795. IC 1871 is a minor nebula slightly detached from the left side of IC 1848. There are seven star clusters which are known to be in the region of the Heart and Soul nebulae. Two of these star clusters (IC 1805 and IC 1848) are intimately connected with the nebulae and have the same catalogue numbers. Also in this part of the sky are the famous 'Sword Handle' clusters (h and Chi Persei) in Perseus - two of the brightest star clusters in the sky. Below is a map of the star clusters and nebulae in this region. Also labelled on this map are the two Maffei galaxies (Maffei I and Maffei II). When these very obscured galaxies were first discovered they were assumed to be nebulae and were even catalogued as nebulae (Sharpless 191 and Sharpless 197). It was only later that it was realised that they were galaxies 15 million light years behind the Heart and Soul nebulae. 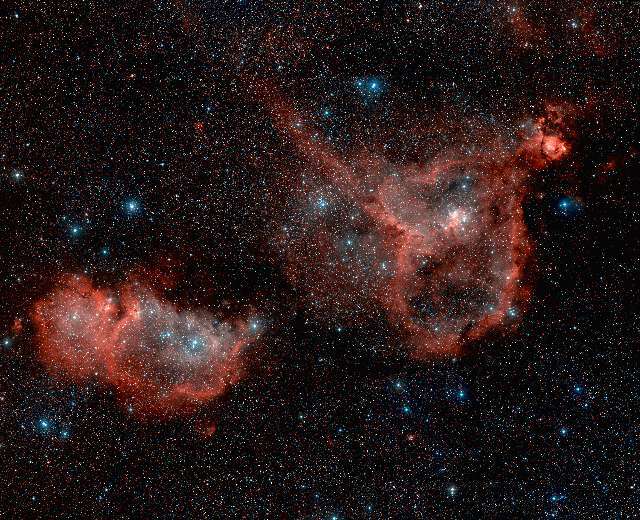 The distance to these two nebulae are well determined, mainly because they have star clusters at the centre of them. (It is much easier to determine the distance to a nebula if it has star clusters in it). The Heart and Soul nebulae are located in the Perseus Arm of the Galaxy 6000 and 6500 light years away. This part of the Perseus Arm has a lot of star formation regions and there are many young star clusters in this region. Right - a close-up view of IC 1795 which is part of the IC 1805 region. The very brightest part of this nebula is separately classified as NGC 896, because it was the first part of this nebula to be discovered. Below - the pair of star clusters known as 'h Persei' (NGC 869 - right) and 'Chi Persei' (NGC 884 - left). This pair of clusters is also known as the 'Sword Handle' clusters (because of their location in the constellation of Perseus). These two clusters lie near to the Heart and Soul nebulae although they probably did not form in the nebulae (Chi Persei seems to be 1000 light years behind the nebulae, although h Persei is closer).